A dramatic day started with all the pomp and ceremony of a brass military band – Syd Stelvio having to step in to help with the conducting at one point – and the Mayor and small baby insisting on riding in the navigator’s seat of Itala car number one. Karen Ayre having to trudge in her leather long trench-coat and knee-high boots to the far side of the square before the Mayor decided he had done enough for his voters. Thousands thronged round the cars so a somewhat chaotic early morning start from the centre of Ulaan Bataar. 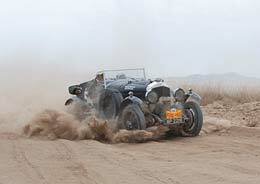 A Ghost was left behind to repair a gearbox, an Alvis was still hunting for spare petrol cans, and Itala number two of Jonathan Turner and Adam Hartley was also feeling rather lonely – the news on this intrepid pair is that they need a new crankshaft to be made from a solid lump of iron, and, they have bent the back axle, a mere minor issue compared with the disaster in the engine. “We will be back…” says the driver, “Power Station Number Four have promised us a new crankshaft.” So, emulating Charles Goddard of Spyker fame in 1907, they now plan the most heroic of catch-ups. Out of town, the rally really got going… good tarmac rippled across vast grassy plains, only the odd horseman for company. Catch one far horizon and you dip and rise and suddenly aim at another far horizon, under bright blue skies, and rising temperatures. A feel-good factor abounded with that good to be alive feeling. We turned left off the main drag, only a morning bus provided the single oncoming traffic for all at this point, and then headed across another wide open plain, this time on a dusty dirt road with potholes filled with powdery dust. Another Time Trial had the clocks ticking and pulses racing for all. 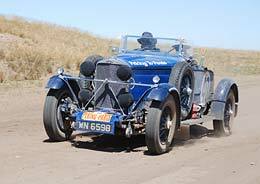 Times show that the Vauxhall 30/98 of Michael Power and Malcolm Green set best time among the Pioneers of 24 minutes, with Fred Brown and Thomas Stevenson’s Rolls Royce Silver Ghost on 30:28. The battle for top honours among the Vintageants was again taken by the green Chevy Fangio Coupe of David and Sadie Williams on 18 minutes 20 seconds, with the similar Chevy of Xavier del Marmol on 18:36, Paul Merryweather on 18:52 and Australian maestro Gerry Crown in a big Buick on 19:07. Paul Carter is best Bentley on today’s Time Trial with 22:50. In the Classics Category, Hans Peter Linder in the two litre Mercedes 200 saloon dressed up as a taxi complete with taxi light on the roof set a time of 18:41, the Jaguar of Richard Worts and Nicola Shackleton on 22:45, and Tom Hayes and Andy Vann, with Andy at the wheel, stomped to a stop in a large cloud of dust with a time of 21:37, much to the displeasure of Chris and Jan Dunkley, who were instantly covered in most of the flying dust, so much so the Bentley refused to re-start in protest at such hooligan antics from the Studabaker crew. Today has been a great day, and we all ended up at the petrol station eager for our dinner from our mobile chuck wagon – a spat over fuel supplies marred the atmosphere momentarily, as all crews have been given vouchers for 80 octane, and here in the wilds of nowhere, the gas station had a pump boasting 93 – enough to fool a good many, but the fact is the petrol all comes from the same hole in the ground regardless of what it says on the tin. Vouchers are for 80 octane, and if you want anything else, you have to pay more…a fact that was lost on some. This disagreement quickly ended with all those lining up for a refuel engulfed in a sudden sand-storm. The camp had hot vegetable soup, salads, hot slices of roast beef and roasted potato, and, to wash it down, bottles of Moet Champagne…flown in, we suspect, by Peter Livanos. Nothing washes the dust out of your throat quite like a cool glass of champagne when in the middle of Middle Earth. That’s it for now – we are now off to light the stove in felt lined Yurt, we are going to need it tonight as the wind is getting up, this could be coldest night we have experienced so far. Bentley Boys in their flying jackets look like they have dressed correctly for dinner.